Doubling as a curio cabinet and secretary desk, our Amish Rectangular Curio Cabinet with Secretary Desk is a great option for a small office, living room, or even a store where the secretary desk could hold a point-of-sale terminal while the built-in display case could be used to entice customers with impulse goods. This formal style curio case and desk has an antique feel to it, and can be custom made in your choice of wood, finish, and hardware from a variety of options. 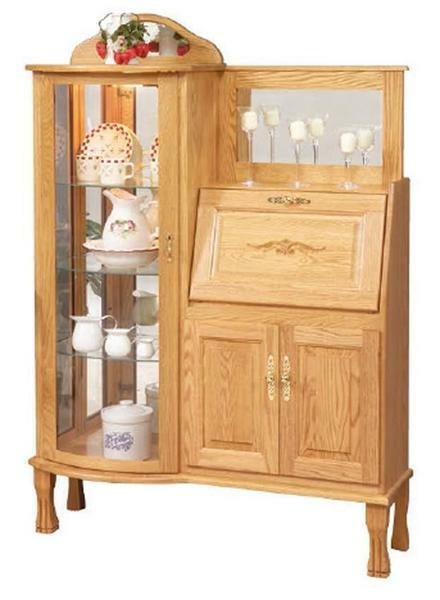 Standard features of this Amish-made, heirloom-quality constructed display cabinet and desk include solid wood construction, adjustable glass shelves, display touch lighting, cubbies and a drawer in the top behind the drop front, storage behind two solid wood cabinet doors, and a mirror above the drop front. Shown in oak wood, this unique piece can be made in your choice of wood, finish, and hardware from a variety of options.